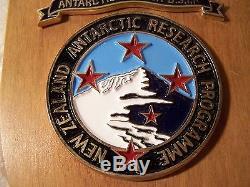 Wooden plaque with colored glazed medal that states "New Zealand Antarctic Research Programme". 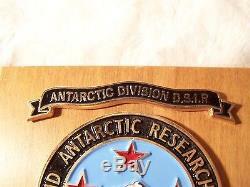 Two other ribbon pieces with the top saying "Antarctic Division D.
R" and the bottom saying "Scott Base". This is manufactured by Upmark Productions as noted on the label on the back. 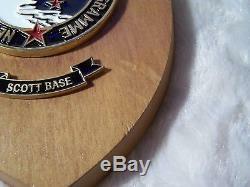 Plaque has some dents in the wood on the front and some cracks/dents on the back. 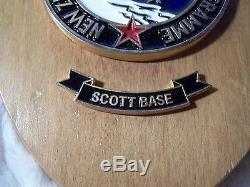 Rare and a must have collectible for Antarctic memorabilia collectors. Measures about 5" x 4" x 1. For more information about the research group, you can view the wikipedia page (search NZARP). We are fair, honest, and easy to work with. 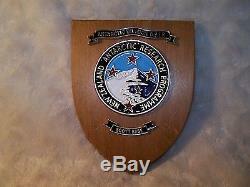 The item "New Zealand Antarctic Research Programme NZARP DSIR Scott Base Wood Plaque Rare" is in sale since Wednesday, October 8, 2014. This item is in the category "Collectibles\Decorative Collectibles\Wall Hangings, Mirrors". 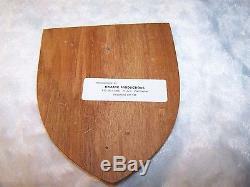 The seller is "sunflowerbuys" and is located in Overland Park, Kansas.